Power is back on for all Prince Rupert and Port Edward customers after losing the utillity for seven hours on Saturday. A transmission circuit failure knocked out power to approximately 8,000 customers around 11:30 a.m. PT this morning. 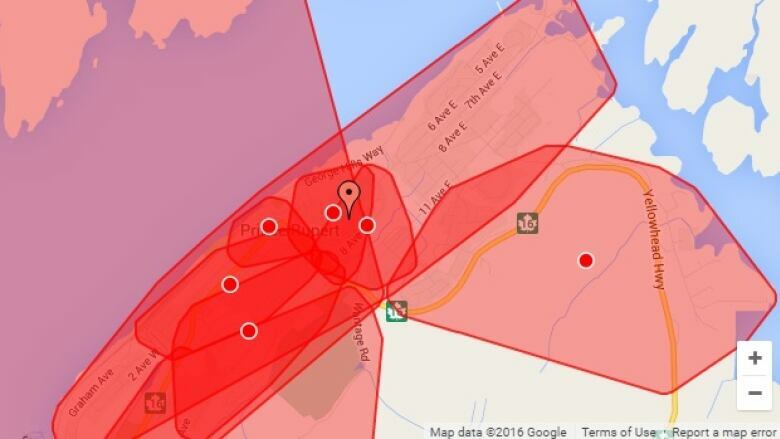 BC Hydro has restored power to all customers in Prince Rupert and Port Edward. On Saturday from 11:30 a.m. to 6 p.m. PT, 8,000 customers were without power due to a transmission circuit fail. "We appreciate everyone's patience, this has been an unusually long power outage for Prince Rupert," said Simi Heer, a spokesperson for BC Hydro. "We do have redundancy built into the system so if there is an issue on the transmission line we have back-up generation that's supposed to kick in and supply power to the city. However today there were also issues at that generation facility."